A wise woman once said, Collect Experiences, Not Things! She was indeed wise. While you can certainly give Chocolates, Flowers, Diamonds, or other expensive gifts to your loved one on Valentine's Day, why not give the gift of an unforgettable experience. A wise woman once said, "Collect Experiences, Not Things"! She was indeed wise. While you can certainly give Chocolates, Flowers, Diamonds, or other expensive gifts to your loved one on Valentine's Day, why not give the gift of an unforgettable experience. The Couples' Valentine-themed Paint Night is exactly that, a fun experience to experience together. 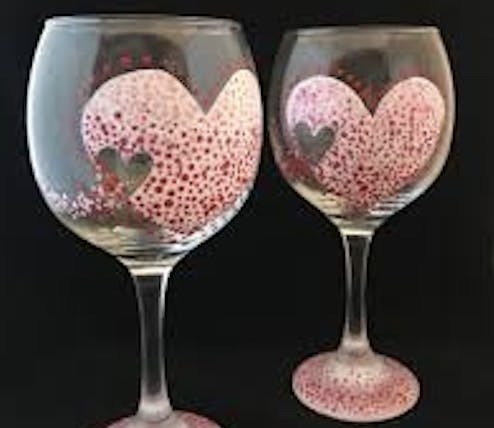 Enjoy 2 hours of fun and togetherness painting glasses for each other, sipping wine and creating special memories. Can I paint alone, by myself?